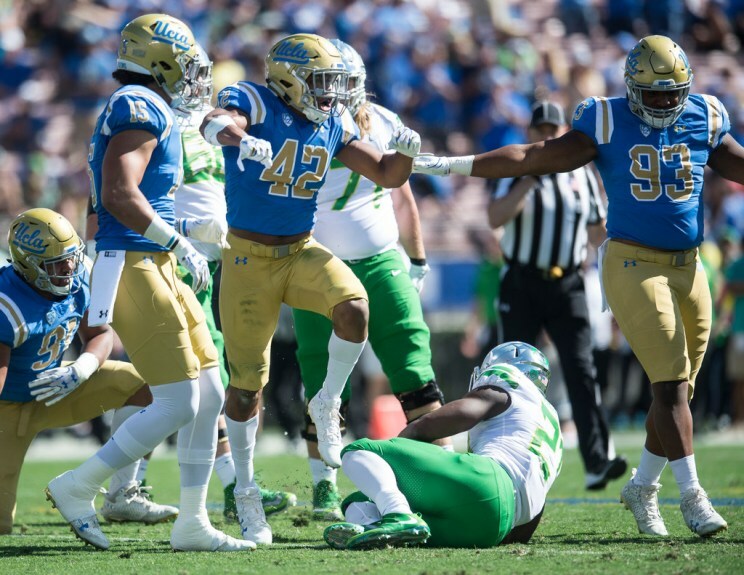 With 101 tackles on the year, senior linebacker Kenny Young earned his first career first-team All-Pac-12 honor on Tuesday, along with second-team honors for quarterback Josh Rosen, offensive tackle Kolton Miller and safety Jaleel Wadood. Receivers Darren Andrews and Jordan Lasley, offensive linemen Scott Quessenberry and Najee Toran and defensive lineman Jacob Tuioti-Mariner were named honorable mentions. More on UCLA’s all-conference performers. A full of both All-Pac-12 teams. This entry was posted in Football and tagged Darren Andrews, Jacob Tuioti-Mariner, Jaleel Wadood, Jordan Lasley, Josh Rosen, Kenny Young, Kolton Miller, NaJee Toran, Scott Quessenberry by Thuc Nhi Nguyen. Bookmark the permalink. Good for him. I definitely remember some posters on this site calling him out a few years ago that he was awful and wasn’t good enough. Way to grow and prove people wrong. And Rodney Peete was chosen first team all-conference over Aikman. This story will play out the same way. he gonna mary holy robinson pete also? or u saying he gonna not mary any one for no reeson other then the obviuos? That was so funny. . .that you should keep your day job (probably at McDonald’s).